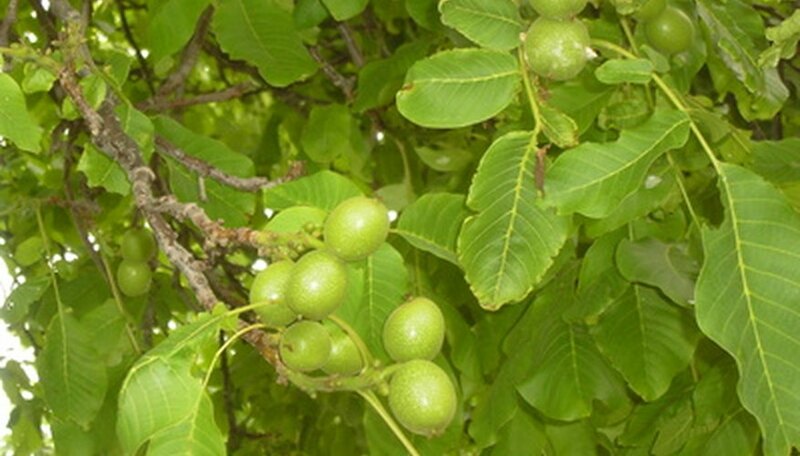 Black walnut trees are tricky to transplant due to a taproot system. The taproot projects directly below the main trunk. Older black walnut tress may have a taproot that is half the length of the tree’s upper trunk. Only small saplings or seedlings can be transplanted. The size of the 1-year-old seeding should be in the range of ¼ inch to 3/8 inch diameter 1 inch up from the soil line. Dig the new transplant hole first before removing the young seedling from its current location. Black walnuts must be transplanted before any green leaf growth of bud swell. The depth of the transplant hole must be at least three-quarters of the overall height of the seedling. In other words, if the young black walnut seedling is 24 inches high, the hole must be at least 18 inches deep. Make the hole's diameter 6 to 8 inches. Loosen the soil in the new transplant hole by using the shovel and rock bar. Pull any large stones from the hole. Dig a circular trench around the black walnut seedling using the shovel. The overall diameter of the trench must equal the diameter of the new transplant hole. In other words, the root ball from the seedling must fit inside the newly dug transplant hole. Dig the trench to the same depth as the transplant hole, approximately 18 inches. Work the shovel under the young seedling once the overall trench depth has been met. Pop the young seedling’s root ball from the circular trench using the blade of the shovel. You may have to work the shovel around the underside of the root ball for a good extraction. The goal is to remove as much of the root ball as possible, including the taproot. Place the extracted seedling into the new transplant hole. Fill in any soil around the root ball of the new seedling. Use you hands to pack the soil around the root ball. Water the new seedling into the transplant hole. This will remove any air pockets around the root ball. It may take up to 10 gallons of water to thoroughly soak the new seedling into the transplant hole to remove all air pockets around the roots. You can construct a small-diameter tree shelter out of woven wire and wooden stakes. Pound the wooden stakes into the soil on either side of the new young transplant. Make a hoop of the woven wire so it will reside on the outside of the stakes. The woven wire will keep large browsing animals such as deer away from the young foliage. Remove the woven wire fencing after three years of growth. What Does It Mean to Thin Seeds When Planting?